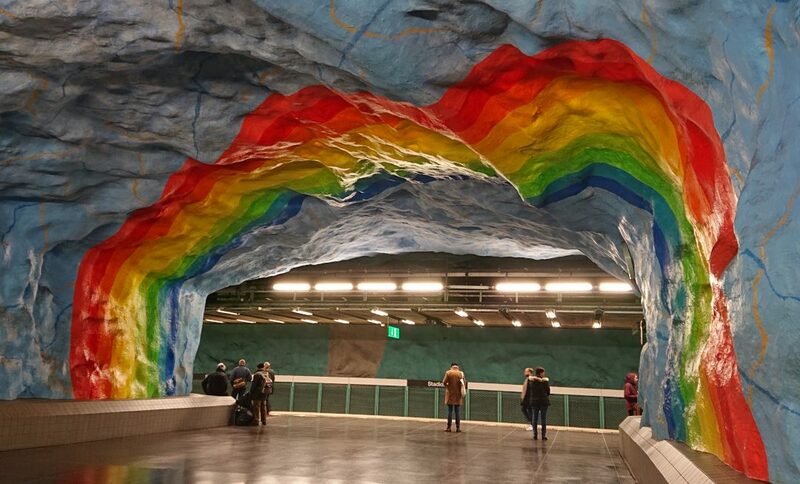 Surely you’ve heard about the Stockholm metro as the longest art gallery in the world, and actually it is, because more than 90 stations, of the 100 that make it, have been adorned by more than 150 artists. From 1957 the stations were built with the participation of artists such as Per Olof Ultvedt (T-Centralen), Lars Arrhenius (Thorildsplan) or Lennart Mörk (Tekniska Högskolan) and later, those that had already been built were also remodeled. Thus, as the engravings and mosaics, the sculptures and the paintings, they made their own touch in a public space and took a place in the daily life of the inhabitants of the city. It is believed that the idea of ​​incorporating works of art in subway stations arose from the need to reduce possible acts of vandalism and give travelers a different experience, making the traveling more enjoyable. The truth is that it has worked very well, as the stations are not only very well maintained but the Stockholm metro, has become an attraction itself (one of the most accessible by the way) and receives thousands of curious tourists every year. You can see a lot of tourist taking photos in the stations. It has been difficult for us to select only one nice station, here are five of the most beautiful subway stations. Undoubtedly, a perfect plan for a winter afternoon or if the weather is bad. The Central Station (T-Centralen) was inaugurated in 1957 and is the location that connects the three metro lines and the network of trains, both national and international and of the local airports, so it is estimated that the average daily passenger flow It is 219,000. It was the first of the stations intervened and undoubtedly the most striking is the pedominio blue color on the platforms of lines 10 and 11. Per Olof Ultvedt (renowned painter, graphic artist and set designer) was who designed the murals, and some art guides theorize about the relaxing properties of this color and its use in such crowded spaces. Stadion is on the red metro line and is the most colorful. Located a few meters from the main area where the Stockholm Pride takes place, finding a colorful rainbow does not seem like a simple coincidence. Also, in this area, the stadium where the Olympic Games of 1912 took place and gives its name to the station. Today, Stadion is still one of the great stadiums in Stockholm and regularly organizes sporting events and concerts. Kungsträdgården was inaugurated in 1983 and is 29.3 meters below sea level, being the lowest metro station in Stockholm. The station is located below Jacob’s church and crosses Kungsträdgården, literally translated as “The King’s Garden”. It was designed by the artist Ulrik Samuelson, inspired by the palace destroyed by the fire of 1825. The Makalös Palace had been built there in 1643 and had a beautiful French garden. After the fire, the site was used for military exercises and finally, in 1875, the park was taken over by the Stockholm City Council, which transformed it into a public space. Part of the sculptures and ornamentation that had belonged to the palace were incorporated into the design by the artist, and today can be seen in the metro station. Another unique feature of Kungsträdgården is the presence of spiders Lessertia dentichelis. This species is usually found in caves, and this place is unique in northern Europe. It is believed that it has arrived from southern Europe together with the equipment and machines brought in when the station was being built. Thorildsplan is on the green line and was one of the stations built in 1952 and later remodeled, in this case in 2008 by Lars Arrhenius. The artists were mostly free to intervene in the stations, but in the case of Thorildsplan, the only premise that Arrhenius had to follow was that tiles were used. The artist recreated a kind of videogame, inspired by the crossings of streets, roundabouts, elevators and stairs, where even the characters of the pac-man appear represented. Tekniska Högskolan is part of the red line, and was inaugurated in 1973 to facilitate the access of students and teachers to the Royal Institute of Technology. The station has been decorated in homage to the discoveries and advances of science, so it is possible to find, for example, an apple “floating” in the middle of the platform that represents the theory of gravity, one of the three laws of the movement of Newton, as well as Polhem’s mechanical alphabet and Da Vinci’s attempts to create a flying machine. Well, are you ready to explore the subway? Come on! Grab a ticket and get lost among its stations. I assure you that you will end up discovering new things as soon as you cross the controls! Ya, I really liked the Stockholm subway, really cool stations. Kungsträdgården was the coolest I saw. I really agree with this post.